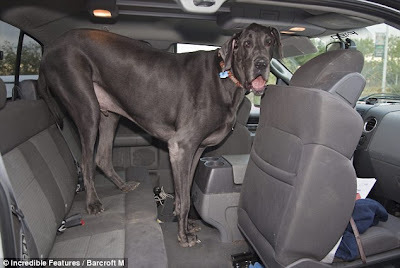 Standing at nearly 43 inches tall from paw to shoulder and weighing a staggering 245lbs could this be the world's new tallest dog? 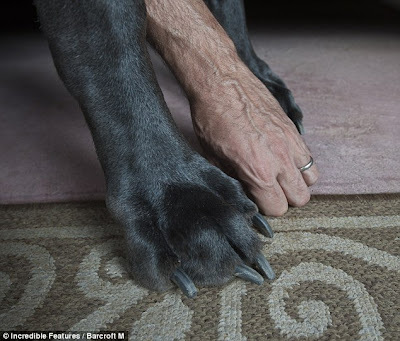 The gentle giant, who measures 7ft 3ins from nose to tail, could be a prime contender to take the title from the former record holder, Gibson, a harlequin Great Dane who passed away from cancer last August. Now George's owners, David and Christine Nasser, are awaiting confirmation from Guinness World Records to see if he has achieved the lofty heights. According to David, George consumes 110lbs of food every month, and sleeps alone in his own Queen Size Bed. David and Christine raised George from when he was 7 weeks old, but never expected him to grow so big. 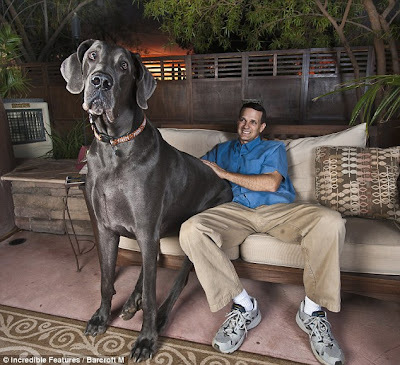 Pictured here in the parks of Tuscon, Arizona, George, a four-year-old blue great dane, looks more like a miniature horse than a dog. The couple eventually had to move their aptly named dog out of their king sized bed, when he grew too large for the three of them to share the same sheets. David is currently rushing to get that necessary documentation into Guinness as other dog owners are coming forth claiming the record. As they wait for the results to come through, George is busy occupying himself with his new found stardom and even has a Facebook fan page and Twitter accounts for his adorning fans. 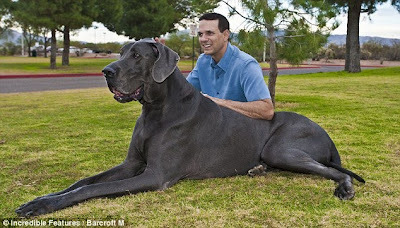 It appears as though the sky's the limit for this mammoth hound. omg im sure thats things taller than the statue of liberty.